Matt Hill is the kind of ball of insatiable energy that reminds us all why we love life. Born and raised in British Columbia, Canada, Matt was always running with a spirit for life and people unmatched by most. His teachers thought that making him run might help quell his endless energy. But instead, a mile run down the lane behind his school gave him even more energy. Running was something that Matt just couldn’t get enough of –in fact the only non-athletic award that Matt ever won was for a public speaking contest in the 7th Grade. The topic: running. Matt, like his hero Terry Fox didn’t just love running in of itself. He also dreamt of doing something that would make a difference in the world as he watched Terry run across Canada on his Marathon of Hope. At the age of 10, Terry etched an indelible mark on Matt’s life. Though the big dream would take another 28 years to fulfill. Since the age of 12, Matt has enjoyed a successful career as an actor in Film and TV (www.Matt-Hill.com). Some of his noteworthy roles were in films like Titanic, Shanghai Knights with Jackie Chan, and everyone’s favorite Turtle, “Raphael”, in Teenage Mutant Ninja Turtles III inside the green turtle suit. Matt has always related to kids, perhaps it's because they share his unguarded enthusiasm for life, which lent to the next career door opening, being the voice behind dozens of cartoon series, where he has voiced the characters of, “Korey” in Being Ian, “Metal Head” on GI Joe, “Raphael” on Turtles and “Ed” on the hit cartoon, Ed, Edd and Eddy – watched by about 33 million kids every day. He’s also been the recognizable announcer voice behind radio and television campaigns like: Boston Pizza, Gatorade, Honda, Home Depot, Bread Garden, McDonalds and a list of others, 20 years deep in the making. All of this time, Matt didn't stop running, but also lent his energy coaching fellow athletes and his elementary school track team for 12 years. Speaking and moderating on numerous panels within both the sports and entertainment industries have been a fun addition to his acting work. He even holds a personal record for being master of ceremonies for over 14 of his friend’s weddings! He tried his hand at triathlon and eventually completed Ironman Canada seven times. But the fire was still burning to contribute with his life, doing what he loved; running, speaking to people and being the change he wanted to see in the world. Then in 2006 on a flight to Detroit, the dream to inspire a continent landed at 28,000 feet. 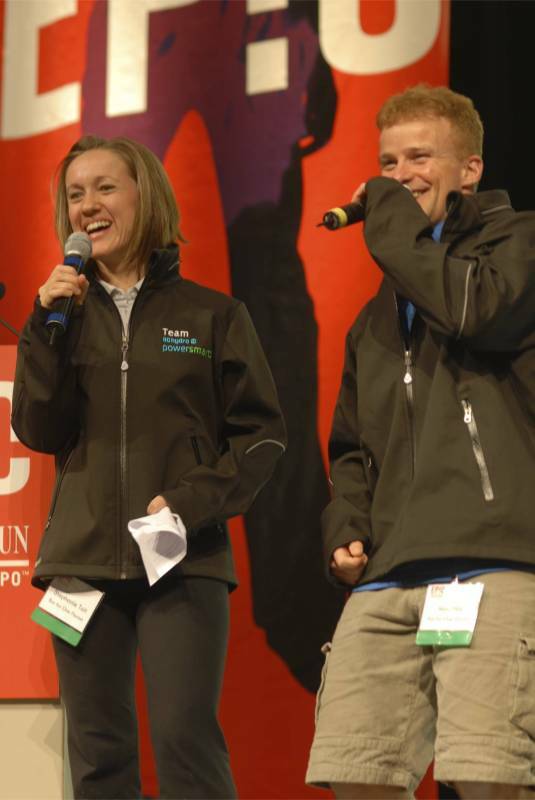 He co-founded Run For One Planet (www.runforoneplanet.com) along-side his partner, Stephanie Tait. After training for 18 months and totalling 10,000 hours worth of training, planning and fundraising, they took their 1st steps on May 4th, 2008 with the Vancouver Marathon and eventually covered 11,000 miles around North America, totalling 420 marathons as a dynamic duo of two, 1.5 million calories burned each and 14 pairs of Asics destroyed. Fuelled by Blueberry protein shakes and the burning desire to inspire Action for our Planet’s health. Matt was privileged to speak to over 30,000 kids in 200 presentations and raising over $120,000 for their Legacy fund. Their motto “small steps add up” was the key to every success they realized, as the journey of 11,000 miles begins with one step. Upon completion, Vancouver Mayor, Gregor Robertson declared May 8th as official “Run For One Planet Day” in the City of Vancouver. Although the run is now over, Matt’s passion to inspire continues as he serves as Director for the Run for One Planet’s Legacy. He is also a proud member of BC Hydro’s Team Power Smart, alongside, Steve Nash, Bob Lenerduzzi, and Chip Wilson. His leadership skills on building a successful run tour have him speaking to nationally distinguished organizations like lululemon athletica, Whole Foods Market, Planet Organic Market and Asics, as well as, other local groups striving for excellence, like Olympic athletes and Student Leadership Conferences. Matt is honoured to continue his work as Run For One Planet Co-Founder, continuing his love of voice acting, race announcing and sharing the great adventure with people for many years to come.